OAK 311 has received this issue. Your service request ID is #897602. Please check back for status updates, or contact us directly at 510-615-5566. The City of Oakland addressed this issue on 04/25/2019, service request #897602. OAK 311 has received this issue. Your service request ID is #897579. Please check back for status updates, or contact us directly at 510-615-5566. The City of Oakland addressed this issue on 04/25/2019, service request #897579. OAK 311 has received this issue. Your service request ID is #897606. Please check back for status updates, or contact us directly at 510-615-5566. 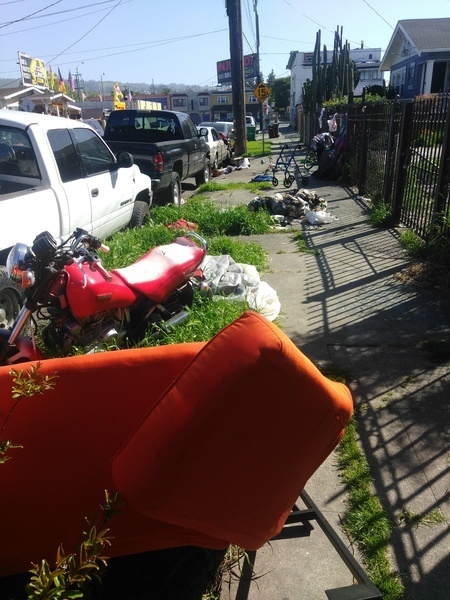 The City of Oakland addressed this issue on 04/25/2019, service request #897606. OAK 311 has received this issue. Your service request ID is #897208. Please check back for status updates, or contact us directly at 510-615-5566. The City of Oakland addressed this issue on 04/25/2019, service request #897208. OAK 311 has received this issue. Your service request ID is #897206. Please check back for status updates, or contact us directly at 510-615-5566. The City of Oakland addressed this issue on 04/25/2019, service request #897206. OAK 311 has received this issue. Your service request ID is #887486. Please check back for status updates, or contact us directly at 510-615-5566. The City of Oakland addressed this issue on 04/25/2019, service request #887486. OAK 311 has received this issue. Your service request ID is #891569. Thank you, in advance, for your patience as we work through a backlog of pothole service requests. Unfortunately the City does not have enough funding to repave all streets in poor condition. With limited funding, our response to resurfacing requests is limited to minor pavement and pothole repairs only. Our Street Maintenance Department will assess your street and determine whether temporary measures might be appropriate. Please understand that this work may be limited to pothole or other minor repairs, and that we have many similar requests. We will do our best to respond in a timely manner. The backlog of streets in Oakland needing pavement currently is $435 million and growing. The City of Oakland addressed this issue on 04/25/2019, service request #891569. The City of Oakland addressed this issue on 04/25/2019, service request #897745. OAK 311 has received this issue. Your service request ID is #898665. Thank you, in advance, for your patience as we work through a backlog of pothole service requests. Unfortunately the City does not have enough funding to repave all streets in poor condition. With limited funding, our response to resurfacing requests is limited to minor pavement and pothole repairs only. Our Street Maintenance Department will assess your street and determine whether temporary measures might be appropriate. Please understand that this work may be limited to pothole or other minor repairs, and that we have many similar requests. We will do our best to respond in a timely manner. The backlog of streets in Oakland needing pavement currently is $435 million and growing. Thank you for your request. According to our system, we already have an open service request of this kind at this location. Your request has been combined with service request #746531. If you would like to check the status of the request, please contact OAK 311 at 510-615-5566 or OAK311@oaklandnet.com. There are several large potholes and depressions along Arcadia Avenue which are causing cars to drive on the opposite side of the street into on-coming traffic to avoid them. Please have them repaired. Thank you. OAK 311 has received this issue. Your service request ID is #898760. Thank you, in advance, for your patience as we work through a backlog of pothole service requests. Unfortunately the City does not have enough funding to repave all streets in poor condition. With limited funding, our response to resurfacing requests is limited to minor pavement and pothole repairs only. Our Street Maintenance Department will assess your street and determine whether temporary measures might be appropriate. Please understand that this work may be limited to pothole or other minor repairs, and that we have many similar requests. We will do our best to respond in a timely manner. The backlog of streets in Oakland needing pavement currently is $435 million and growing. I agree with Sharon about the danger imposed by these potholes and have definitely seen cars trying to avoid the potholes as such. Thank you for your request. According to our system, we already have an open service request of this kind at this location. Your request has been combined with service request #716706. If you would like to check the status of the request, please contact OAK 311 at 510-615-5566 or OAK311@oaklandnet.com. This issue can also be followed by watching http://seeclickfix.com/issues/3258986.